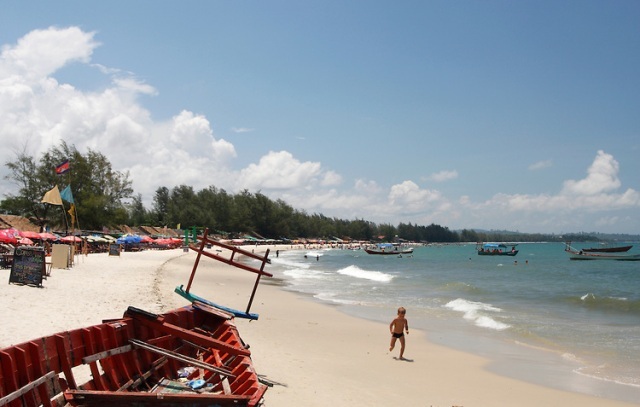 Sihanoukville is a prime tourist destination located in Southern Cambodia. It is a peninsula that is poking into the Gulf of Thailand, only a few degrees above the equator. This premier Southeast Asian beach town is known for its collection of white-sand beaches, tropical sun, warm surf, salty humid air, and an over-all lazy atmosphere that is perfect for an uneventful vacation in Paradise. Its beaches and natural landmarks are scenic, unspoiled, and secluded. It is also teeming with major restaurants, bars, and local food kiosks that serve simple but extremely delicious sea food Khmer dishes. The New York Times refers to this idyllic beach city as “Asia’s next trendsetting beach” destination. It is also the home of Cambodia’s only international and commercial sea port that is regularly visited by cargo ships, naval ships, and cruise ships from all over the world. Important landmarks within the city are the Golden Lions Monument, Independence Squareand Cambrew Brewery, while at the outskirts are its beaches. The main ones that tourists must not fail to visit are Sokha Beach, Independence Beach, Ochheuteal Beach and, of course, Serendipity. The well-known Ochheuteal Beach is a short walk from downtown and to the northern end of this long beach is Serendipity Beach. One would know that he or she has reached Serendipity for the many shops, restaurants and guesthouses. Strolling along, to one side is a calm, clear blue sea, while on the other side are the lively stores, colorful commodities, and friendly smiling locals. There are just so many activities going on here, in contrast to the natural calmness of the sea, sand and breeze. An afternoon nap on a chair under an umbrella by the beach after sipping a cool fruit shake is not a bad idea. There are also several hotels near the coastline but since the beach is practically next to any point within the city, it won’t matter if one decides to stay in cheaper accommodations farther from the beach. The beaches are just a short walk along Ekareach Street all the way to the Golden Lions Circle and on to a road that goes over a hill and directly leads to the sea. It is quite a scenic stroll, but often disturbed by passing tuk-tuks and motodops incessantly trying to convince pedestrians to take a ride instead. After dark, the sun-drenched beach turns into a night of partying and drinking. There are a number of pubs, bars and night clubs that light up the night life. The rows of restaurants also join in the party by selling barbecues and other dishes that are not offered during the day. Given more international exposure and local development, Serendipity Beach is looking to compete with the top beaches in Southeast Asia, which include nearby Bali in Indonesia and Phuket in Thailand. (Speaking of beaches, if you happen to be in the Philippines and you’re planning for an island getaway vacation then check out Boracay blog for more information about the island. )For now, though, a major plus side of Serendipity is that it is relatively much lovelier, more peaceful, and more tranquil since over-commercialization has not reached it.